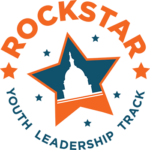 The RockStar Youth Leadership Track is a unique series of learning opportunities offered throughout The Training Institutes which supports youth and young adults in increasing their capacity and knowledge to advocate for systems and social change. The track also offers the opportunity to help adults understand how to create a shared space and mutual respect and understanding with youth in their own communities. The program is led by Youth MOVE National and a team of young adults in collaboration with the University of Maryland, Baltimore.